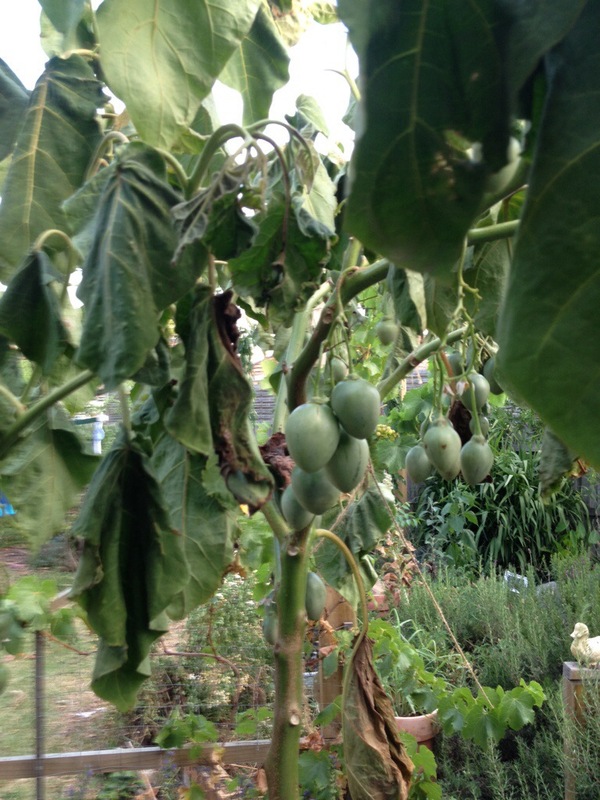 I’m surprised that Solanum betaceum (Tamarillo), does not feature more often in permaculture systems. They are a fast growing small tree with good drought resistance, thrive in a strong wind when kept in bush form to about 2 meters, and of course, they make delicious fruit – sweet tomato with a hint of sour! Now the tree in question is the first one of its kind to grace my garden, and seeing how I am the happy parent, here are the happy snaps throughout the fruit growing season. So how good is this tree? Let’s have a look at some random facts that you possibly don’t need to know but will be compelled to read, at which point you will be unable to resist buying my latest book from Amazon or iTunes (aka resistance is futile). You see people bringing fruit to the office all the time, so how many of them have apples, oranges, maybe figs if your lucky. 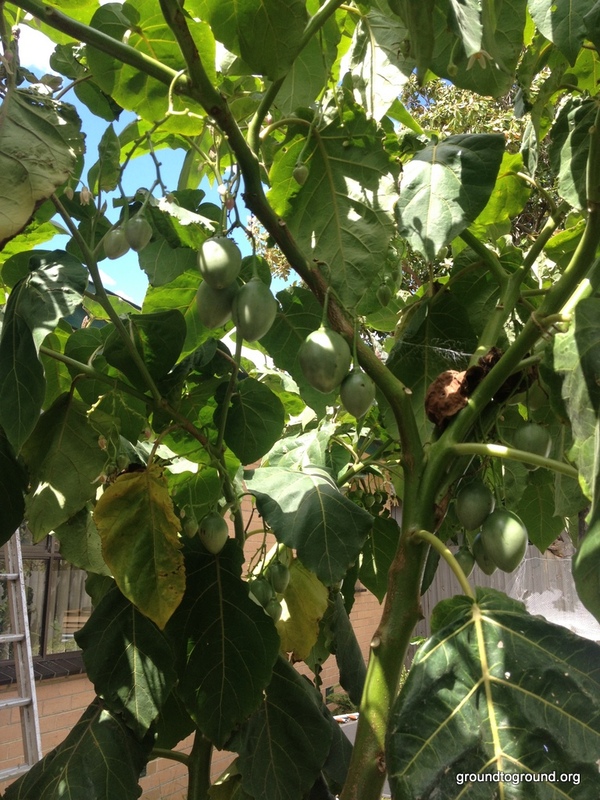 How many of them have a Tamarillo? Good chance it is none, which makes your snack all the more interesting, plus its got a heap of vitamins and other junk like that. 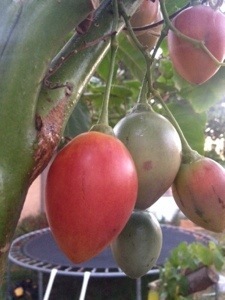 The Tamarillo tree will last you about 12 years, which is ideal for charting the lifecycle of a new family pet. Whichever one dies first, replace the other one at the same time! 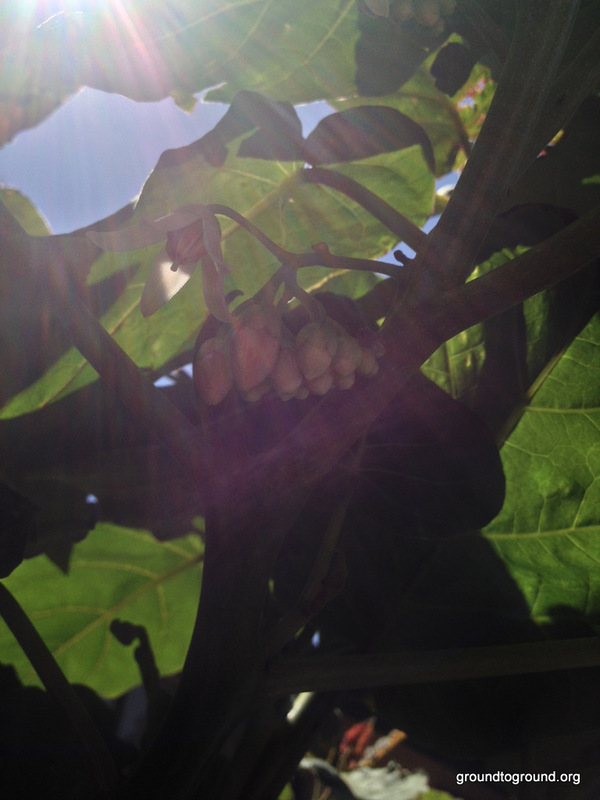 The Tamarillo tree does not like the kind of relentless Summer sun that visits me here in Melbourne, Australia. During our most recent heatwave, i.e. 40+ Celsius days with strong dry wind gusts, the poor tree was wilted and about half the fruit dropped. It even burned some of the fruit that would later ripen. If you get these kinds of weather conditions, then try and place the tree in partial shade, or even as an understory plant. 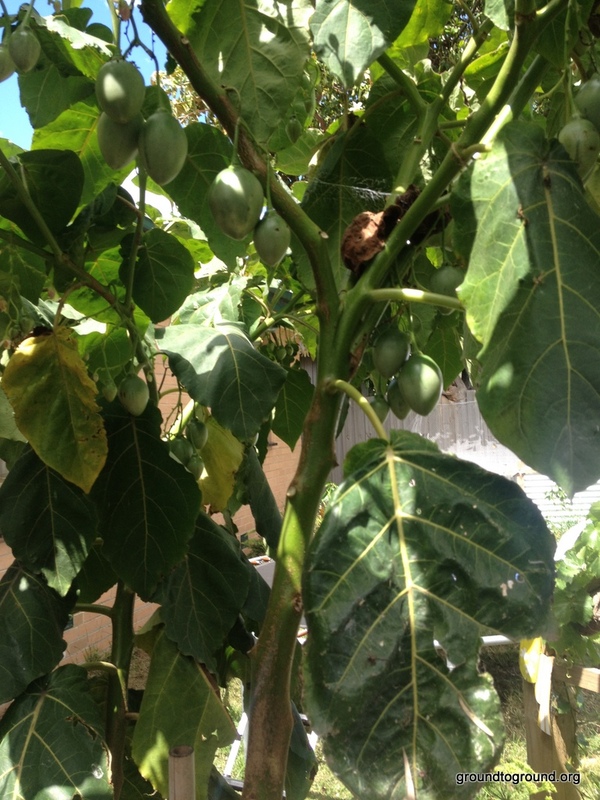 The Tamarillo is more productive with a hard prune after each growing season. Fruit sets on new growth, so the more you cut back to the trunk, the higher the number of individual fruit next year. If you want fewer but larger fruit, then do a partial prune. 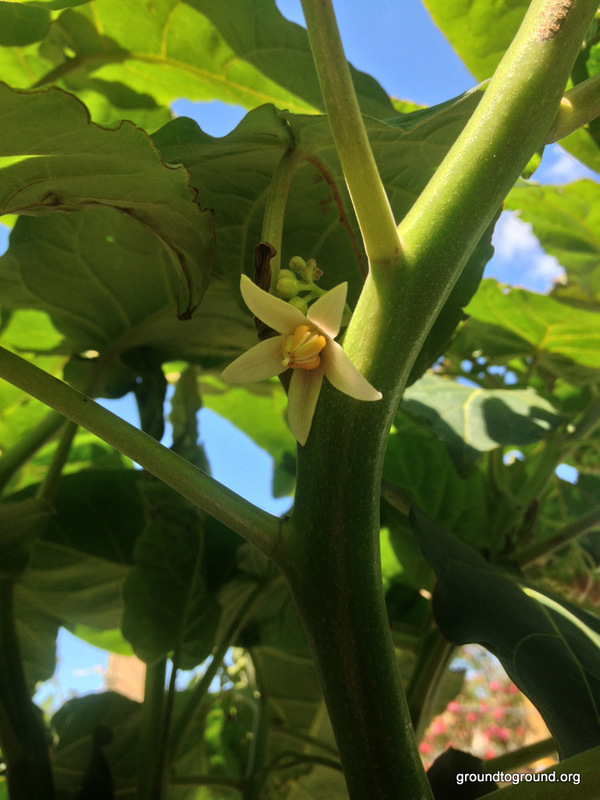 And like any other food producing tree in your garden, the Tamarillo provides yet another source of sustenance you for and the family/community. The one sitting in my yard started giving fruit after 12 months, about 3 kilos worth, and will increase this amount year on year for some time yet. Add it to the apples, cherries, figs, and things that come out of chickens. A great tree to include in the forest garden! 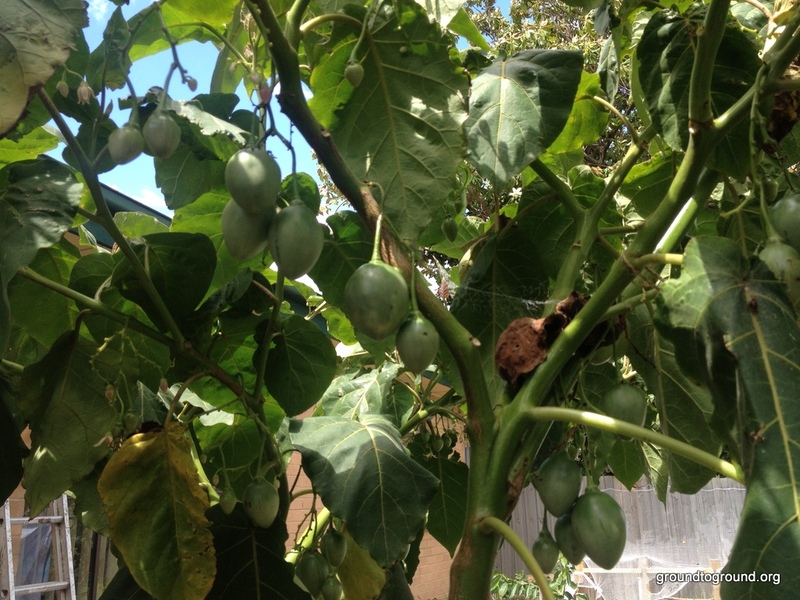 Are you growing a Tamarillo tree? What’s it doing for you? 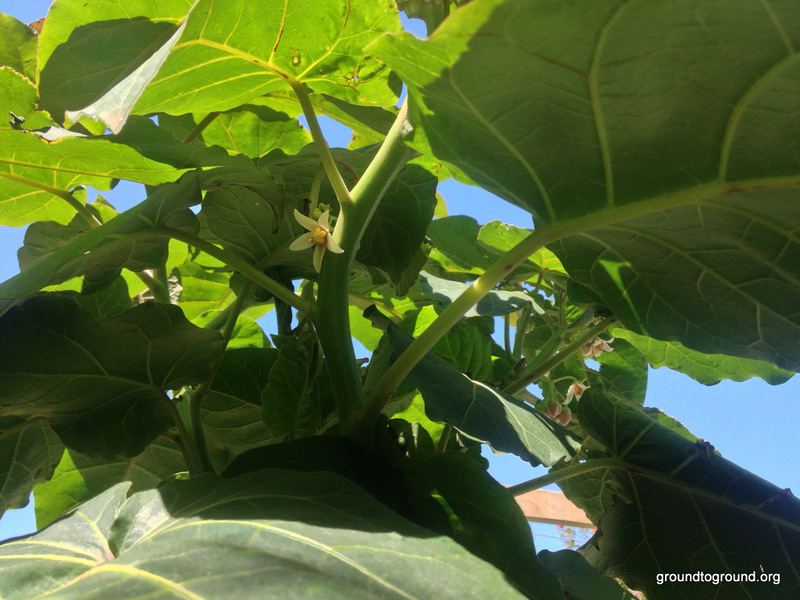 Tags: garden, gardening, tamarillo. Bookmark the permalink. I have planted one from seed from a fruit I got from the food swap about a year ago. It is now about as tall as I am. It was struggling in the heat too but is bouncing back with the milder weather. I don’t think it will fruit this year although I see a small bunch of flowers but I’m hoping for a harvest next year! 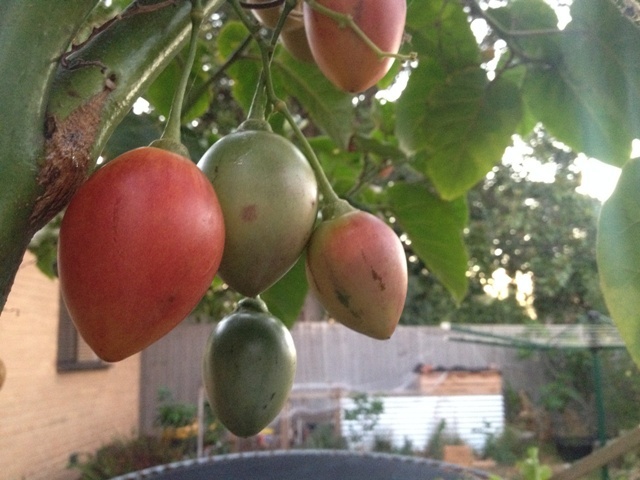 Also looking to plant the orange/yellow/golden tamarillo…see if someone has some to swap too! Thank you for writing in. How did you grow it from the fruit exactly? Did you do something with the seeds first or just throw them in the soil – please let me know as have been having trouble trying to grow from seed myself. I ate the fruit and kept the seeds aside. Then I let them dry out and kept them till spring, just in a dish sitting on the bench. Then I sowed them as you would tomatoes, only 2 survived (snails and slugs and neglect!) but can’t remember how many germinated. Then when they were about a foot tall, I planted one into ground and neglected the other one again 😛 So now I have 1 tall plant left but aphids are attacking it! Do you have that issue too? Yes I do actually, and seems more on this tree than any other. Must be those large succulent leaves? I find the best way to remove them is with a shot of water from the hose on a high pressure setting, mindful of not yearning holes in the leaves. I’ve also let a few leaves get full of them so that beneficial insects can get a feed from them. Forgot to say that I did wash them out first before drying. I have read that tomato seeds need to be fermented before drying. So I wonder if tamarillo seeds are the same. I think so – thanks for the advice, I’m going to do the same.